Welcome to Frank Perry’s website! Frank is a leading expert in Himalayan singing bowls. He is a composer, performer, astrologer, artist, healer and has invented musical instruments that are part of his set up which is made up of 100’s of percussion instruments including gongs, bells, bowls, metallophones etc. Frank has been a part of the soundscape/healing music scene since 1968 and continues to dedicate his life to his music and spiritual beliefs. He is based in Ringwood Hampshire but has performed at many events around the UK and abroad, he has been published in many magazines since 1971, he has featured on 108 album releases, and he has been featured in many written articles and has had several TV and radio appearances. 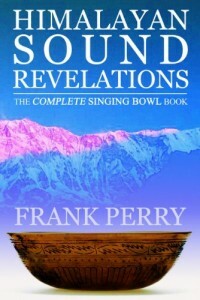 Frank Perry’s long awaited book has sold out of the first edition. Due any time soon is the second edition with a whole new chapter added plus an addition to the appendix. Click on the image to find the book on Amazon!